As I mentioned in my last post, I am among other things, a dance artist and teacher. It’s been a curious balancing act, making dances and making quilts. It hasn’t always been easy to keep a foot in both worlds; they are such different endeavors, and pull me at times in very different directions. Being a dance artist means a lot of moving out and into and around the world. It’s actually very social. Finding resources for projects, opportunities to dance, applying for grants and festivals and performance venues. The dancing life means a lot of casting the nets wide and reeling them in to see what’s come back. Unless I want to make dances in my living room (which I’ve done plenty of, believe me) I need to find space out there, rent a studio, borrow a church basement, find an open space with a decent floor. Making dances, unless they are solos, means working with other bodies, making friends, connections, or being part of a collective. The rehearsal process, be it for choreographed or improvised work, is dense with outward communication, and I’m often looking for ways to find language for material that is either pre-verbal, or beyond the realm of words. Classes happen in groups, performances are offered to the masses (I joke here…if you know anything at all about contemporary dance, you’re at least smirking, if not laughing along with me!) It’s a lot of diving in deeply, and then reaching out. I’m imagining a gesture here that accompanies these words: a movement that starts with the fingers tinkering over the solar plexus, like sprinkling salt over a soup and gradually moving out with both arms, fingers open into a wide-armed full wingspan reach, the eyes bright and blinking wide open. Quilting has another gesture altogether and the movement goes the other way, from full wingspan to tiny hands holding threads over the … is it the heart? The head curves forward, (as if bent over a sewing machine!) and the eyes squint, the brow furrows a bit…the focus is inward. Of course I’m over-simplifying here, in an attempt to get at an embodied understanding of why I feel so drawn to both worlds. I don’t mean to imply that dance-making is all external and quilt-making makes me an introvert, but the two ways of being, the two lifestyles, live mostly for me at the opposite poles, at least when it comes to how social I need to be, or the details of how to organize my time. And it’s been a challenge maintaining a deep practice of both simultaneously. When I say challenge, I mean, nearly impossible. I find myself moving through seasons with each practice…when the dance work is plentiful, I throw myself into it and let it take me over, often traveling and touring for weeks or months at a time. When the dance work is sparse, or when I come home full from a trip and need to integrate, or in the deep of the winter when the days are short and the introspections are long, I make quilts. I need both in my life. (I actually need more of both in my life, but that’s another story.) 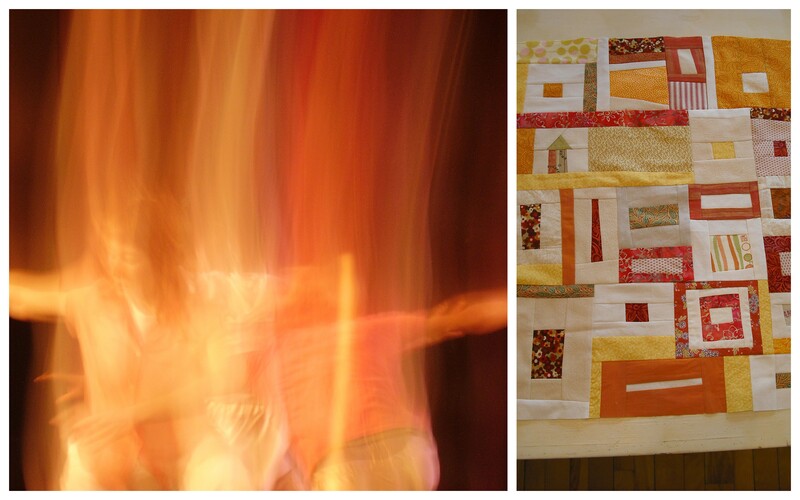 For nearly twenty years I’ve considered dance improvisation as my life’s work, and quilt-making as my hobby. Problem is, I hate that word, hobby. I’ve also noticed, with some chagrin, a subtle tendency on my own part to diminish or de-value my work as a quilt-maker. In seasons of doubt or discouragement, I can fall into that awful trap of labeling. Or worse…ranking. Work I make with my hands is not as important as the work I do out in the world. It’s not intellectual, or significant, or relevant. It certainly isn’t great for paying the bills, but then again, neither is dance. When I’m doing one, I miss the other. I keep trying to find some balance and piece the two together. The obvious patchwork metaphor is not lost on me here, I am living it every time I lay right side to right side and glide it under the pierce of the needle. Every time I press those seams and smooth open the newly joined sections, I feel something come together inside my mind, like the simple and quiet satisfaction of a question answered. In that small moment, my life makes sense. I am fully present and at peace with exactly what is. Interestingly enough, it’s my other passion – writing – that is acting not only as a bridge here, but as a powerful catalyst. Helping me navigate this territory, uncovering layers of what I know in my bones and have forgotten, guiding me out of the seasons of doubt. The work I make with my hands is relevant. It’s completely relevant, and completely connected to who I am and why I am here. It’s not an either/or. It’s a both/and. And so I keep going, keep piecing, keep dancing, keep asking…keep following the threads of what shows up my life, and trusting in the simply beauty of what emerges when I do.